1) Bonsai relieves stress. At least for me, I do know that when I view my bonsai or when I’m creating it, I forget about everything else. My breathing becomes relaxed and life seems slower. It’s a stress reliever for me. I’m not going to pull out the data or supporting studies but I’ve heard many times that stress causes a lot of havoc to your health. Relieving stress could right away improve your health. 2) Bonsai requires physical interaction. Depending how involve you want to be. Creating and maintaining a bonsai will require you to move. Do you remember the Karate Kid movie when Daniel-san went to collect a bonsai tree from the cliff. That’s the extreme physical involvement of bonsai (high intensity physical involvement) or be like Mr. Miyagi and just use scissor to trim the tree (low physical involvement). The bottom line is you’re moving, that’s important when you want to be healthy. 3) Bonsai can exercise your brain. Like your muscles, your brain needs exercise as well. Not in a stressful way but more in a playful way. Again, I will not pull the data but your brain must be healthy to live a healthy life. Depending on what level you want to be, bonsai will stimulate your creativity, awareness, memory, and learning. 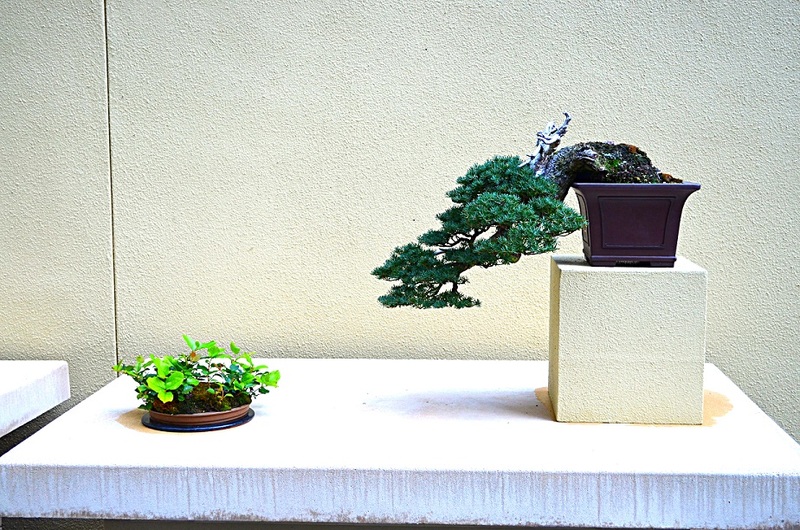 Creativity – Bonsai is an art. When starting a new bonsai, there can be many possibilities. This will require you to creatively think of what to do with the material you got to maximize the tree’s future aesthetics and health. Awareness – Sometimes bonsai people also call this “sensitivity”. Bonsai is an art involving a live material. The artist must be aware of the tree’s requirements for health and longevity. Tree will require the basic water, fertilizer, lighting, and ventilation. Also, trees pruning requirements, branch, leaf, and roots. Awareness of the season and the corresponding tree responses and growth. Awareness is more than the brain working, it’s almost like becoming the tree and feeling the seasons (not to be zen-ny). If this is all new to you, don’t stress out. Realize that you may kill your tree, accept that, and learn. I know I killed many. Memory – Your memory is like your soul. I once saw an episode of “Walking Dead” (not that I followed this show, in fact I didn’t like it, but my wife followed it and could not help but be subjected to it), when they were showing what happens to the “walkers” (zombies) brain when they got attacked by the virus, their brain dies and then later comes back to life. When it comes back, the memories are all gone. Therefore the body is just a walking shell. Imagine loosing your memory, you’re a “walking dead”. Bonsai will certainly exercise your brain’s memory. When did you last water, fertilize, root prune, etc. your trees. Not to mention, remembering the names of your trees (common name and latin names). That should be enough to exercise your memory. Learning – You’ve probably heard of it before, “when you stop learning, you stop growing”. To expand on this idea,, you stop growing, you start dying. In bonsai, there’s so much to learn, just depends how far you want to go with it. Learning keeps your brain active. I’m going to go as far as learning will keep you young. 4) Bonsai is an example of Persistence and Resilience. Some of my favorite bonsai trees are the old looking, gnarly, and yet healthy and beautiful ones. In a way, bonsai is an art that portrays victorious survival from harsh elements and conditions… and when the storm is over, the tree is even more beautiful. The tree shows persistence and resilience. Wouldn’t it be great to learn from this example? What makes our life more beautiful it’s not just the outward look of our successes (money, house, cars, other material things). It’s knowing that you’re a better person because of your hard work and struggles. If you’ve struggled or struggling with health issues, be like a bonsai, persist and be resilient, your battle scars will add to your beauty. This cascading Mountain Hemlock is more than 300 years old. You can tell the story from its trunk. Mountain Hemlocks typically will grow upright but this particular one was collected where there was a lot of struggle with the elements. It probably spent most of its life being weighted down by snow at high altitude, hence the curved trunk. The dead wood is a sign of past struggles but look at this tree, it’s proud and beautiful. This tree was collected by Dan Robinson, selected by Boon Manakitivipart for bonsai, I cared and initially style it for 6 to 7 years with guidance from Michael Hagedorn. Sold it to my good friend Don Guilliams. Don currently owns this tree and this photo was during its exihibition at the Pacific Rim Bonsai Museum. 5) Bonsai is about hopeful future. The process of creating a bonsai is that one is required to think about the future. Not only that one have to think about the future, but one have to visualize a positive outcome for the tree. You hear athletes visualize the outcome of their game in a positive way. Bonsai is no different. Visualizing a positive outcome is a big part of bonsai. For your health’s sake, you must do the same. Disclaimer: I’m writing about health but I’m not a medical practitioner. If you used my advise and you became unhealthy or it did not work for you. Stop eating the fertilizer cakes, they are not real cakes. which is what these little trees become as well. I’m enjoying your blog so far. Keep it up! Glad you found my blog. I’m an amateur blogger needing lots of practice. Glad you like it so far. By the way aren’t you one of Hagedorn’s students? That mountain hemlock was greatly influenced by Hagedorn. Yes, I’ve been studying with Michael. Unfortunately I didn’t get the chance to attend any of his seasonal classes last year through. Hopefully this year I’ll be back there again. Can i copy it for presentation purposes? Yes, no problem as long as you credit me and/or this website.